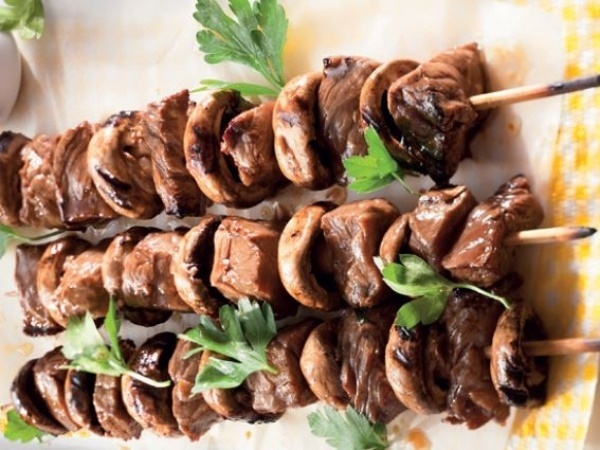 Thread the mushrooms and meat alternately on pre-soaked kebab skewers and braai over moderate coals until the meat is done to your liking. TIP: Instead of making kebabs, marinate rump or sirloin steaks in the teriyaki sauce for 4 hours and braai the meat until done to your liking over moderate coals so the sauce does not burn. Serve on freshly baked rolls topped with generous =servings of fried onions with baked or fried chips on the side.